Notice: The 2007 episodes were only recorded in Portuguese. In this podcast Ricardo presents a retrospective of 2007 of Project Management, focusing on the main challenges and results of the year. The next week podcast, last of this year, will aproaches the future, presenting the perspectives for 2008. This podcast was recorded only in Brazilian Portuguese. The link below is for the Brazilian Portuguese version. Many times during the crisis management, the last alternative to the organization is to abort the project. However the cancelling process could be significantly traumatic to the organization. In this podcast Ricardo talks about strategies to early finish the project aiming to minimize the damage aggravated by the crisis. This podcast was recorded only in Brazilian Portuguese. The link below is for the Brazilian Portuguese version. 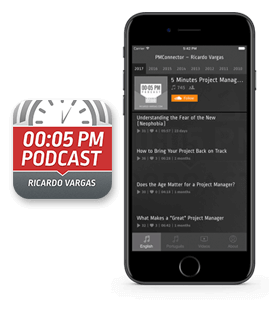 In this podcast Ricardo talks about the most controversial and contentious concepts related to time management in projects: the critical chain. This podcast was recorded only in Brazilian Portuguese. The link below is for the Brazilian Portuguese version. In this podcast, Ricardo approaches the most diverse responses that could be given to project risks, aiming to reduce the total level of exposition of the project, as also improve the chances of new opportunities. This podcast was recorded only in Brazilian Portuguese. The link below is for the Brazilian Portuguese version. Learn with Ricardo Vargas in this podcast the importance of the negotiations skills for the project manager and how to become a powerful negotiator. This podcast was recorded only in Brazilian Portuguese. The link below is for the Brazilian Portuguese version. Ricardo Vargas presents the highlights of the PMI Global Congress Latin America directly from Cancun in Mexico. This podcast was recorded only in Brazilian Portuguese. The link below is for the Brazilian Portuguese version.